Acorn TV is a streaming service headquartered in the US, that offers television programming from the United Kingdom, Ireland, Canada, Australia and New Zealand. But it’s only available for viewers in the US and Canada. If you try to access the site from outside of these countries, you won’t be allowed to sign up and existing customers won’t be able to sign in. 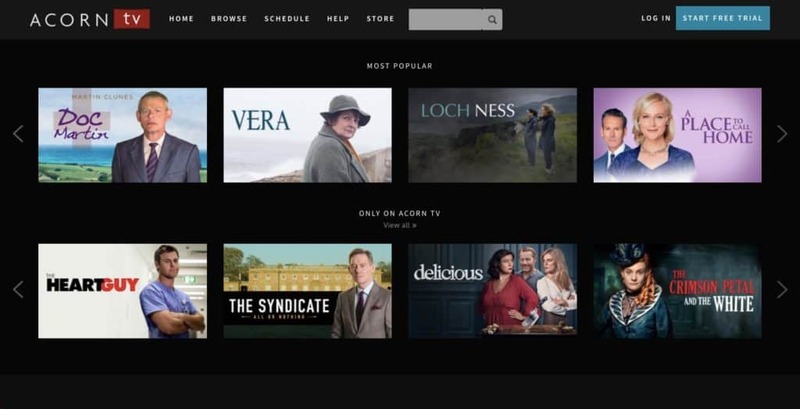 It doesn’t matter whether you had originally registered for Acorn TV from the US or Canada and are now trying to watch content from another part of the world. The policy is the same. The easiest way to unblock Acorn TV is by using a VPN. ExpressVPN Our #1 choice. Superfast network with plenty of reliable servers in the US and Canada. Hard to beat on security and privacy and apps are easy to use. Includes 30-day money back guarantee. NordVPN Budget provider with a vast network of servers that doesn’t skimp on privacy or security. Great unblocking capabilities. IPVanish Favorite for remote control users for its easy-to-use app and great unblocking capabilities. Great unblocking capabilities. What’s the best VPN to unblock Acorn TV? ExpressVPN is one of our most popular services because it delivers a fast, efficient product that doesn’t skimp on encryption protocols. The app is easy to set up and I’ve never encountered any problems in my months of using the provider. The company operates over 3,000 servers spread across 94 countries. 22 locations are in the US and three in Canada. Finding a suitable server shouldn’t be a problem. Privacy concerns are allayed by the fact that ExpressVPN does not store any detailed traffic logs. There is a tiny bit of metadata retention, specifically the date (not time) of connection, choice of server location, and total bandwidth used. But that’s not going to give away your personal identity. ExpressVPN uses 256-bit AES-CBC as its default encryption protocol as well as both HMAC authentication and perfect forward secrecy. These are considered sturdy and military-grade. There’s an internet kill switch included, which the company refers to as a ‘network lock’. This feature adds an additional layer of security by temporarily halting all web traffic if the connection drops. Express is also able to unlock content on Netflix, Hulu, and BBC iPlayer. Apps for both Android and iOS are included as well as a desktop client for Windows and MacOS. BEST VPN FOR ACORN TV:ExpressVPN is our #1 Choice. With a vast server network that is optimized for high-speed connections, it’s perfect for watching Acorn TV. User-friendly apps for all operating systems. Hard to beat on privacy and security. There is a 30-day money-back guarantee so you can try it risk-free. NordVPN is another premium VPN service and has been around for over a decade – helping it engender a loyal community of fans along the way. It’s similar to IPVanish in the sense that it offers a zero-logs policy – there’s absolutely no retention of information related to user sessions, traffic, or timestamps. The company operates 5,111 servers in 60 countries. Over 2,100 of these are located in the United States and Canada. A few servers specialize in video streaming. Nord is one of the few VPN companies that arrange servers according to their specialties and by their location. The service is able to skirt the Netflix VPN ban and unlock content on both Hulu and BBC iPlayer. BEST BUDGET VPN:NordVPN is great value. A good all-rounder that also works well with Acorn TV. Strong security and privacy. Accommodates up to 6 devices. 30-day money back guarantee. CyberGhost is a solid, no-frills VPN service that won’t break the bank and will get the job done from a privacy and security angle. A reassuring factor is that the company says it doesn’t log user behavior and browsing habits, so that should ease concerns about privacy and anonymity. It’s also headquartered in Romania, which means it’s not subjected to any mandatory data retention laws. Over 3,700 servers are spread across the world, with over 900 of them located in the United States and Canada. Accessing AcornTV shouldn’t be a problem. The VPN service works with Netflix and BBC iPlayer. As for encryption standards, CyberGhost Pro uses 256-bit AES encryption on the OpenVPN protocol by default along with 2,048-bit RSA keys and SHA256 authentication. There’s an internet kill switch included. GREAT VALUE:CyberGhost is easy to use. A well priced solid performer. Good at unblocking Acorn TV but can struggle with other streaming sites. Comes with a 45-day money back guarantee. IPVanish is headquartered in the US but don’t let that scare you. It’s a robust, speedy VPN that won’t compromise your privacy. There’s an internal policy of not storing any traffic data at all, making it a truly logless connection. IPVanish is a decent option for streaming video as it includes servers optimized for speed, stability, and security. Globally there are over 1,300, with 684 in the US and Canada. Encryption standards are among the best in the business. It uses 256-bit encryption on the OpenVPN protocol by default, SHA512 authentication, and a DHE-RSA 2,048-bit key exchange with perfect forward secrecy. The latter feature means that all past web sessions will remain encrypted even in the unlikely scenario of a hack. An internet kill switch is included by default. IPVanish doesn’t work with Netflix or Hulu, but is a good choice for BBC iPlayer. However, all information is stored only for 30 days and is used for troubleshooting purposes. We haven’t come across any cases of the data falling into the wrong hands. VyprVPN is also firmly in control of all the web traffic moving through its servers. The company operates entire data centers rather than renting server space from third-party providers, which is standard in the VPN business. All connections are encrypted by the OpenVPN protocol, 256-bit AES encryption, 2,048-bit RSA keys without perfect forward secrecy, and SHA256 authentication. VyprVPN includes an internet kill switch by default, which means internet traffic will be halted temporarily if the connection drops. For an added fee, users can avail the Chameleon ™ protocol that further obfuscates your connection, making it even more difficult for your ISP to figure out that you’re using a VPN. There are over 700 servers spread across the globe with 9 locations in the US and Canada. EASY TO USE APP:VyprVPN is user friendly. Works well with Acorn TV and most popular streaming services. Good performer but a bit pricey. 30-day money-back guarantee. Should I use a free VPN to unlock Acorn TV? Free VPNs are heavily present on the interwebs and seem like an attractive option. That’s because you don’t ordinarily have to sign up with a credit card. But dangers lurk. There’s the real possibility of weak encryption and ensuing data loss. At the same time, there will be data caps, bandwidth throttling, and an extremely limited selection of servers. Israel-based Hola doesn’t operate physical servers like most VPN services but is engineered as a peer-to-peer service leveraging idle user bandwidth on the devices signed into the network. At one point the company had a pretty large user base of almost 50 million. Instead of building on it, the company chose to unethically leverage this critical mass to create a massive botnet and then engage in Distributed Denial-of-Service attacks on other sites. The VPN industry was shaken a few months ago when it was alleged that notable provider Hotspot Shield had been injecting tracking cookies into users’ browsers, mining the data, and selling it to advertisers. The company was also accused of forcefully diverting HTTP requests to affiliate sites, where it could earn a profit. The complaint was officially lodged with the FTC and we’re still waiting on a ruling. PureVPN admitted to handing over existing user details to the FBI in order to help them nab a suspect in a case of online blackmail. That’s despite the fact that the provider had a ‘no-logs’ policy at the time, when in fact PureVPN has been and still does log users’ real IP addresses. If you’d like to stream AcornTV on your PC, Macbook, or smartphone, then all you need to do is sign up for a VPN, log in to the companion app or desktop client, connect to a server in the US or Canada, and use AcornTV normally. We recommend that you clear your cookies first before following these steps. This will help remove old location identifiers. These devices don’t come with inbuilt support for VPN apps – meaning there’s no native software that’ll do the trick. To set it up we recommend leveraging the VPN on a virtual router. This is possible because most PCs that can connect to wifi are also capable of broadcasting their own wifi signals – similar to how smartphones set up mobile wifi hotspots.